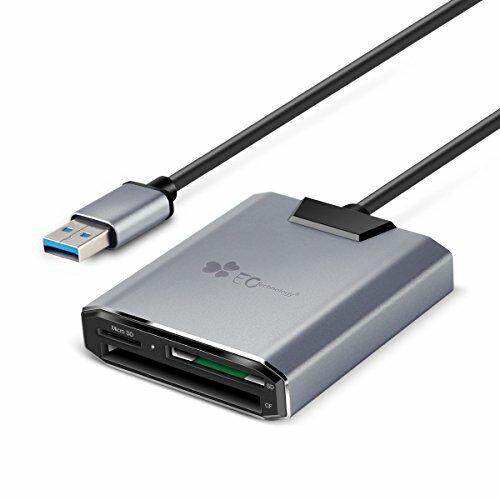 The card reader is allocated with USB 3.0 interface with possible highest transmission speed up to Super-speed(5Gbps)/High-Speed(480Mbps)/Full-Speed(12 Mbps). Backward compatible with USB 2.0 / 1.1. Bulit-in 3 slots: SD, Micro SD, CF. This card adapter can support 2 or more cards simultaneous reading, greatly shorten the reading time. Premium aluminum exterior card reader with white led indicator, more convenient to know data transfer status. The light always on when connect with power, and will flash while reading. 2. Support SDHC maximum capacity 32GB, SDXC maximum capacity 2TB. 3 in 1 USB 3.0 Card Reader: Built-in 3 card slots: SD, Micro SD, CF. Allow you to read 2 or more cards simultaneously, saving more data transfer time. Fast Data/Files Access and Transfer Rate Super-Speed up to 5Gps. Backward compatible with USB 2.0 / 1.1. Extensive Compatibility: This micro SD/SD card reader supports multiple card formats, including microSD/microSDHC/T-Flash, SD/SDHC, mini SD, MMC, MMC Plus, RS-MMC, MMC Mobile, MicroSD (TransFlash), microSDHC. Built-in 30cm cable, easy for both laptop and PC users. Premium aluminum exterior and compact design, makes it durable and resistant soiling. Plug and Play: No driver needed. Hot swapping and auto detection. Package Contents: 1 x EC Technology Card Reader.